Alternate title: one topos, three books… and they could not be more different! Oh, except in that they all have a story that cannot be told without giving out too much! So no summary = no spoilers! The good: I love Ishiguro’s writing, the detail, the tone, the language. (Or maybe I should say I love Ishiguro’s writing translated, because I never read him in the original.) And this book has a very interesting premise, believable characters, and a lot of potential for discussion. The bad:the characters felt like they were only playing at emotions, playing at being human, but I’m not sure whether that’s the whole point of the book (as in, showing that they would not have a soul) or an unwanted byproduct. (Or even, an unwanted byproduct of what, at face value, seems a good translation.) Also, the whole premise was a bit far-fetched, and I was disappointed in how such a sensitive and controversial subject was brought up only to be downplayed. The verdict: I’m very much on the fence about this one. More: I went online and read many reviews, but there’s not one of them that does not give away the central mystery of this book. The edition: American paperback edition by Harperteen, 422 pages. The good: well, I had read good reviews, but did not expect such a good book. I love the way the story unravels, little by little and mystery by mystery. I love the sense of place, of magic, of the hidden links between characters. I love the enclosed world Marchetta created, its rites and costumes. I love the different characters and how each of them goes on looking for his/her own way to adulthood. The verdict: this is why I keep reading YA books. The way the story is told is enough to put this book up in the same circle with some of my most loved ones (The God of Small Things, Goodbye Little Women). More: this counts for the Aussie Author (although it did not feel very Australian to me), the Classic Double and the Semi-Charmed Summer challenges. The good: you know how we all craved for adventures when we were 7-8 years old and reading, like, Verne, or Salgari, or whatever adventure book it was at the time? This book makes you feel like that again, and the adventure it brings on is a well-stuffed one. The bad: I really hoped that this would not turn out to be fantasy, I’d have preferred it that way — but that’s just personal taste. Also, I found the photos a little bit overly unsettling, and I didn’t like the very open ending. The verdict: a good read for a hot summer day, when you want something different. More: oh no! I just discovered this is going to be a series! For me, one was enough. Wondrous Words Wednesday is a weekly meme where we share new (to us) and interesting (to us, again) words we encountered in our readings. See this week round-up at BermudaOnion’s blog! My words for this week come from Jellicoe Road by Melina Marchetta, but they’re not all Australian as I thought at first! It makes me want to yell at the God that I wish I didn’t believe in. For hogging him all to himself. I want to say, You greedy God. Give him back. I needed him here. hog: v. informal take or hoard selfishly. Fruitcake, yum! … Except I don’t think that’s what they mean here. 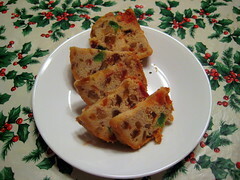 fruitcake: n. informal an eccentric or mad person. He thinks the territory wars are over because you and Griggs pashed. pash: v. Austral./NZ kiss and caress amorously. snog: n. an act or period of amorous kissing. She was so off her face. off one’s face: adj. extremely intoxicated, either by alcohol or drugs. I thought it meant either very happy or very sad, but I was wrong. The story: Australian conservator Hannah is called to work on the suddenly resurfacing Sarajevo Haggadah in 1996. Through the samples she finds within the book, a fictionalized account of its story is reconstructed, each chapter bringing us further and further back in time and across Europe. My experience with the book & my thoughts: I first read this book a couple of years ago, and while I did not write down my thoughts, I can tell you exactly how I felt: I loved the historical fiction, and I had little patience for the general frame, the story of Hannah in modern times. And on rereading, I still feel the same way. The historical parts are well done, each a whole world in the same way that each page of a miniatured manuscript encloses a whole world. In the few pages dedicated to each of this stories, the author was able to recreate a full world, a reality with its intrigues, passions, powers, and characters who each had a full and well-rounded story behind them. Too bad that the same ability is not evident in the frame story, which seemed to be there just to grasp for an easy happy end. I had even less patience for Hannah’s chapters on this second reading — everything was either too predictable or too deus-ex-machina, and there is so much intrigue and things happening, but none of it rings true. Still, I would love to go back and enjoy the small stories any time, so it’s still a good book! The snow light flared on brightness. Blue: intense as a midsummer sky, obtained from grinding precious lapis lazuli carried by camel caravan all the way from the mountains of Afghanistan. White: pure, creamy, opaque. Less glamorous, more complicated than the blue. At that time it would still have been made according to the method discovered by ancient Egyptians. You cover lead bars with the dregs of old wine and seal them up in a shed full of animal dung. I’d done it once, in my mother’s greenhouse in Bellevue Hill. She’d had a load of manure delivered, and I couldn’t resist. The acid in the vinegary wine converts lead to its acetate, which in turn combines with the carbon dioxide released by the dung to make basic white lead carbonate, PbCO3. My mother pitched a fit about it, of course. Said she couldn’t stand to go near her bloody prize orchids for weeks. I turned a page. More dazzle. The illuminations were beautiful, but I didn’t allow myself to look at them as art. Not yet. First I had to understand them as chemicals. There was yellow, made of saffron. That beautiful autumn flower, Crocus sativus Linnaeus, each with just three tiny precious stigmas, had been a prized luxury then and remained one, still. Even if we now know that the rich color comes from a carotene, crocin, with a molecular structure of 44 carbon, 64 hydrogen, and 24 oxygen, we still haven’t synthesized a substitute as complex and as beautiful. There was malachite green, and red; the intense red known as worm scarlet — tola’at shani in Hebrew — extracted from tree-dwelling insects, crushed up and boiled in lye. Later, when alchemists learned how to make a similar red from sulfur and mercury, they still named the color “little worm” — vermiculum. Some things don’t change: we call it vermilion even today. Random thought: I’d like to understand more about the concept of kosher. The story: a teenage girl in Nazi Germany during World War II, Liesel Memminger can hardly read, but she develops a love and crave for books due to several random facts. Her stealing books (either from book burning stakes or from houses) is only part of a life that goes through the tragedy of war, which is nothing more than a setting for her everyday life. My experience with the book & my thoughts: all in all, I enjoyed this book more than most of the other ones I read this year. The story is compelling, and its characters lovable. So: although I got distracted by the snippets of commentary on every page; although I feel that Liesel and Rudy were represented as younger than their stated age (at 14 you were adult, back then; I cannot believe they would get away with all they did if they were already teenagers); although I felt it was very partial to “the good Germans” and forgets all the other people that suffered in that war; still, I can say this was a very good read. The part with spoilers: I felt let down by the ending, all the characters disappearing at once… Didn’t feel right to me. What I liked: characters. I quite liked almost all of them, even those that only made a cameo appearance. What I didn’t like: Death as a narrator. To me, either Death knows the story of each and everyone of us, or he doesn’t. That he would be interested in Liesel and not, say, in her mother… it’s not a nice thought for me. Language & writing: a simple and straightforward style, not much to say about it… except that I hated all the snippets inserted here and there. I don’t like when an author uses typographical tricks to keep the reader interested. Also, I appreciated all the German expressions, but I wonder at how that was perceived by readers who have no knowledge of German. It was a year for the ages, like 79, like 1346, to name just a few. Forget the scythe, damn it, I needed a broom or a mop. And I needed a vacation. In all honesty (and I know I’m complaining excessively now), I was still getting over Stalin, in Russia. The so-called second revolution – the murder of his own people. They say war is death’s best friend, but I must offer you a different point of view on that one. To me, war is like the new boss who expects the impossible. He stands over your shoulder repeating one thing, incessantly. ‘Get it done, get it done’. So you work harder, You get the job done, The boss, however, does not thank you. He asks for more. Random question: why is Death perceived as male in English-speaking countries? And as female in Southern, Romance-language ones? Read this if: if you are looking for a different take on World War 2. The story: check this synopsis, I cannot do any better. My experience with the book & my thoughts: this is the first book I really risked abandoning this year. And I risked abandoning it twice, for opposite reasons. At the beginning, I felt it could be a good book and I was not enjoying because of the language I was reading it in. As it went on, though, I felt that it was a useless book with useless characters. The only reason I kept reading was that, in my edition, the cover proposed this book as the story of two dreamers deciding to move a glass church through god-forsaken lands — I wanted to get to that part, and in the end it was the worst of the book. No dreams there! Ever heard of Vonnegut’s second rule for writing fiction? “Give the reader at least one character he or she can root for.” That’s not the case. There was not one character that was lovable or even understandable. Not even one. Not even a minor character. I found them all wrong and intolerable. She understood, as women often do more than men, that the declared meaning of a spoken sentence is only its overcoat, the real meaning lies underneath its scarves and buttons. But would you say it was ‘practical’ to sing hymns, to give glory to God, to pray, to fast? And what is the practical purpose of a church? For if it is only to provide shelter for Christians—and my dear papa would take this view—then it is better to have your congregation gather in cobblers’ rooms. But if your church, no matter how small, is also a celebration of God, then I would say I was the most practical man you have spoken to all year. Language & translation: I wondered if it was the language that made this book such a success. I may have not enjoyed this in full. Yet I don’t think even the best language could save this book. I found the description of every little detail and gesture to be just boring. And I found many dialogs that were complete nonsense to me (although this is not the first time this happened this year). Random question: can anyone explain the coincidence in this passage? I just don’t get it (nor does my mathematician of an husband). The Leviathan was 690 feet long, 83 feet wide, and 58 feet deep. The Ark (if one allows the cubit as 20.62 inches) was 512 feet long, 85 feet wide, and 51 feet deep. This coincidence was not lost on Oscar who “discovered” the Leviathan two weeks after his fateful evening at Cremorne Gardens. Read this if: I think people who like Victorian novels may enjoy the characterization.